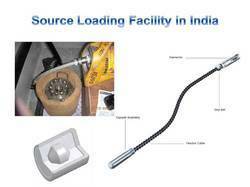 Pioneers in the industry, we offer selenium 75 and source loading facility from India. Ideal for controlling the size of the exclusion zone during radiographic exposures at congested work sites ?? Optimizes image contrast on radiographic films while lower energy photons provide a better response on storage phosphor plates Provides the needed accessibility in fabrications that X-ray generators cannot access. Off shore oil rigs and outages at power generation plants where exposure to non-occupational workers (members of the public) is a problem. EECI is the pioneer private sector organization in the field of Radiography Source Supply. EECI has authorization from Atomic Energy Regulatory Board (AERB) to refill Ir-192 and Se-75 sources in the Sentinel™ brand devices manufactured by QSA GLOBAL INC.
EECI routinely supplies Sentinel TM brand sources to customer in India. Sentinel™ is reputed for quality, reliability ,safety and for manufacturing sources of better focal length. Our Source Refilling Facility based at our facility in Dadra, consists of operational & security measures in accordance with the Regulatory Board requirement. We ensure our standards of quality and safety assurance always apply. We have trained & qualified personnel to man our source Refilling facility. EECI representative will be pleased to assist you with further information with regard to source and source refilling procedures.